Cornelius & Anthony is a a brand that took the cigar scene by storm a few years back. The company has ambition, style, and a penchant for creating cigars in the “flavor bomb” category. My first experience with Cornelius & Anthony was with the Daddy Mac a couple of years ago. To this day that particular blend remains in my top 25 of all time. Today I’m reviewing the Corenlius & Anthony Señor Esugars, a blend which debuted at IPCPR 2017. Stephen Bailey, owner of C&A cigars, called this blend a passion project, and it’s certainly reflected in the name, which is based off of Bailey’s pet Dachshund. The Cornelius and Anthony Senor Esugars Robusto comes presented in C&A’s large, gold and white band, with a secondary band denoting the blend name in small letters. The Mexican San Andres wrapper is a dark, rustic chocolate brown with some interesting marbling to the color. When squeezed gently, the cigar has a moderate amount of give and seems to be packed consistently the length of the cigar. The aroma off the foot is moderate, with notes of barnyard, caramel, cedar, and some spice. After cutting the cigar with a straight cut, I test the draw which is about a 5/10 in terms of the amount of restrictiveness. Possibly a touch loose. The cold draw flavors feature notes of earth, old hay, some chocolate and spice. The Cornelius and Anthony Senor Esugars opens in a way that makes me smile. Why? Because it’s such a damn unique medium-full profile, which is what I’ve come to expect from this brand. The first note I detect is rich, semisweet chocolate. Saddling up next to it is a charred, smoked note, and something that reminds me a bit of a salted chocolate cake. Just as unique is the retrohale, which is quite strong and most closely resembles charcoal. Smoke production is decent but nowhere near what I was expecting given the looseness in the draw. It’s also becoming clear as the cigar burns past an inch that keeping the cigar lit could be a challenge, but that seems to be more the result of my local B&M over humidifying and less the cigar itself. Other indicators of quality construction like the length of the ash and the straightness of the burn are good. As the cigar burns into the second third, the strength settles at medium. The flavor profile shifts a bit, showcasing flavors and aromas of leather, creamy chocolate, and pepper with a baseline bitter note that complements the rest of the flavors well. As nice as these flavors are, though, they aren’t always in balance. The bitter note often takes a bit too much of the spotlight, pitting itself against the other flavors in an incongruous way. The final third of the Senor Esugars illustrates this all too well. 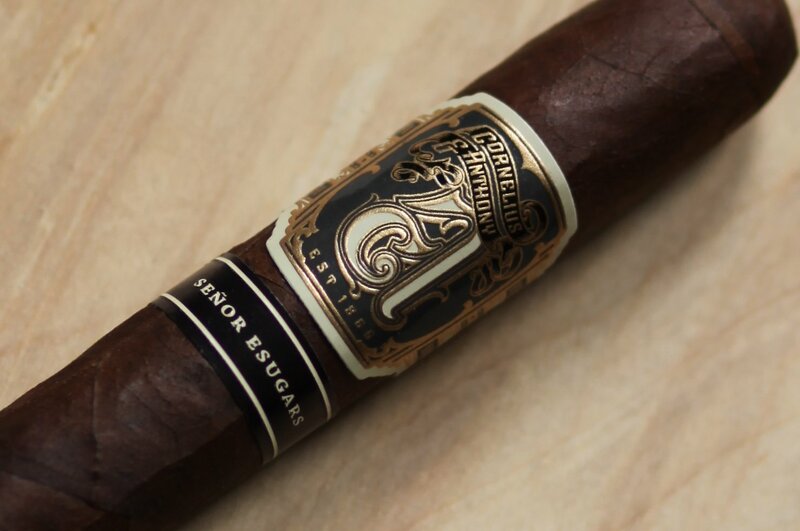 The balance drops off in the last 10 – 15 minutes of the cigar, with the profile heavily leaning on dry wood, strong spice, and charred notes. It isn’t an altogether unenjoyable mix of flavors, but it doesn’t have the harmony that the first two thirds of the cigar showcases. Even with the issues of balance and some small construction problems the Cornelius and Anthony Señor Esugars is a great cigar that I wholeheartedly recommend you seek out. This is primarily because it serves up a flavor profile that I’ve encountered perhaps once in the past in some of the work done by House of Emilio Cigars.